Board 12 has developed a series of courses and workshops to train new officials and continue the education and development of current officials. Some of these programs are still being developed and will be available in the near future. Want to become a basketball official? Board 12 is always looking for people interested in joining our organization. Classes for New Applicants are held once a year: in the Fall. The Fall class runs from early September through November. All course participants receive intensive instruction on the rules and mechanics of basketball officiating. They will be provided rulebooks and enrolled in Rulebox, an innovative software which delivers fully-customized online testing, training and test preparation tools. In addition, applicants will receive on-the-floor training and upon completion will be eligible to officiate entry-level basketball games. The purpose of the Mentor Program is for officials in their first through third years to establish a one to one relationship with a veteran official to enhance their ability to progress in their early years of officiating. This program consists of classroom sessions on preparing for their career, season, specific rules discussions, and guest speakers. Veteran officials are encouraged to observe their participant’s games, work recreation basketball with them, and serve as a counselor to the participating official. The participating official should observe games that their mentor works along with observing the work of other officials to gain as much input as possible. This program is operated out of the Board 12 Interpreter’s office. If you are currently not in the Mentor Program, but feel it would be helpful to you, feel free to contact the Board 12 Interpreter. November 3rd at Northwood High School, sign in starts at 8am. The annual IAABO sponsored Dr. Phil Fox Winter Interpretation Basketball Clinic will be hosted by Board 12 on Saturday, November 3rd, 2018 at Northwood High School. Named in honor of the former Board 12 Rules Interpreter and IAABO International President, the clinic continues Dr. Fox’s commitment to the training and development of scholastic basketball officials. Sign in starts at 8am. There will also be representatives from Officially Sports with a full array of officiating needs for the upcoming season. Our speakers will begin their presentations at 9:00 a.m. The Fox Clinic is a tradition unique to Board 12, its members and area officials. It provides not only a wealth of information, but also an opportunity to interact with other officials before taking on the challenges of the season. The following resource are some suggestions to improve officiating skills. The GameTracker Journal is a comprehensive tool for scholastic basketball officials to be inspired, to learn and challenge themselves to be better every game. This book includes room for tracking 60 games in a season for pregame preparation and postgame analysis. 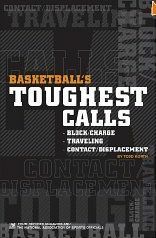 This is a MUST for all basketball referees that would like to personally improve their game. 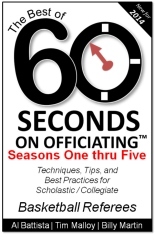 The "Best of 60 Seconds on Officiating" provides a complete compendium of articles from the internationally acclaimed basketball officiating resource, ref60.com. The authors have taken the top articles from the past five seasons and compiled them in one easy to read resource. 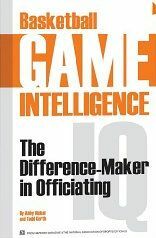 This is a great compliment to the best-selling "Beyond the Rules" series for scholastic and collegiate basketball referees. The topics cover every aspect of officiating and will certainly raise your game to higher levels. Take these best practices, tips, and techniques and weave them into YOUR game -- all provided from the top teaching professionals in the game.